The process of identifying cancer — from taking a sample of a tumour to getting the results back from a laboratory — can be long-winded. This new hand-held microscope could instead help doctors identify cancer cells in just a few moments. Designed by University of Washington mechanical engineers for use in operating theatres and doctors’ offices, the device is said to be capable of allowing a trained medic to identify cancerous tissue. The team suggests that a brain surgeon could use it to check that they’d removed all cancerous traces of a tumour, say, or a dentist could quickly check if an abscess was cancerous to minimise the concerns of their patient. The device itself uses a technique that’s known as “dual-axis confocal microscopy” to achieve sharp focus even a little way into opaque materials. As a result, it can resolve cellular details even up to half a millimetre beneath the surface of tissue. The images are created faster than usual by quickly scanning a light beam across the surface using micro-electrical-mechanical mirrors to build up lines of the image. 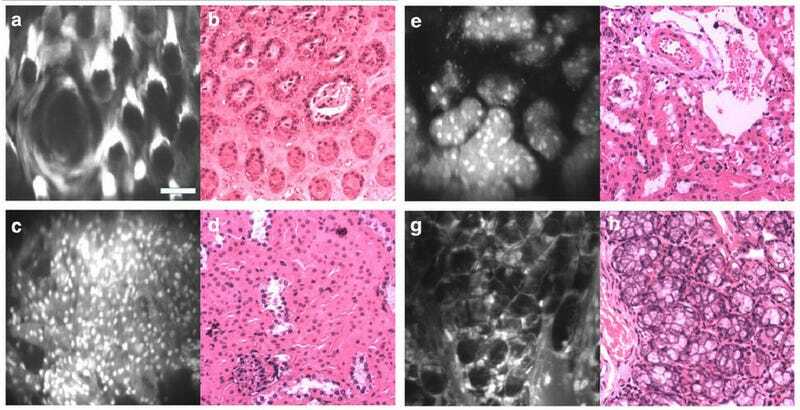 In the pictures below, you can see how the images created by the handheld device, in each case on the left, compare to one created by a multi-day process at a clinical pathology laboratory on the right. Obviously it’s not quite as good, but the result are impressive. Indeed, what doctors would be looking for are variations in sub-cellular details, which tell cancerous cells apart form healthy. You can see in the images that the new devices offers that kinds of insight — with the cell nuclei showing up particularly well.